Coorg is often called The Scotland of the East. The hill station is surrounded by lush greenery and stunning hills. While most tourists visit Coorg for its laid-back vibe and landscape & nature, there are a few who come for adventure sports. Coorg is a great place for adventure sports and one of the popular activities is rafting. The Barapole river is the perfect setting for rafting in Coorg. The river is flanked by beautiful landscapes & scenery and the rapids are excellent for rafting. River rafting takes place in Coorg almost throughout the year. If you want a great rafting experience, its best to go in the monsoon. For an even better experience go river rafting in Coorg is between the months of July and August. The rivers and lakes are full, this means that it is the best time to experience rafting over excellent rapids. During the monsoon, the foliage around the river is at its brightest and the weather is pleasant too. Road: If you are departing from Bangalore, you need to take the Thalassery – Mysore Road and Mysore Road to get to Barapole. The other route is via Kaggalipura. Those coming from Mangalore can take the road via Puttur or go via Kasaragod. A third route is via Madikeri, mostly private and government buses ply on this route. Rail: Mukkali railway station is the closest railhead. As mentioned before, the best place for river rafting in Coorg is on the Barapole river. The rapids are of grade 5, it is quite a challenge and there is plenty of excitement to be had during the experience. There are many operators that organize river rafting in Coorg, you could either pre-book a session or do a booking on the spot. The former is suggested if you are going during the peak season, as there could be a lot of crowds. You could either just enjoy the river rafter on the river or add a few adventure sports such as rappelling and river crossing too. Travel: Booking a return journey to Barapole from Bangalore will cost you around Rs. 6,000. This fare does not include tolls. There are private taxis available from Mangalore and Mysore too. Bus fares from Bangalore to Madikeri cost Rs.500-700 a seat, depending on whether it’s a peak season. Food: For normal meals, you would spend around Rs. 500 a day. You can, of course, reduce the cost if you carry food from home for the journey. Fee for River Rafting: On an average, rafting in Coorg should not cost your more than Rs. 1,500 per person. There are no hotels in Barapole, the closest hotels are in Madikeri and Coorg town centre. You can choose from a variety of accommodations ranging from resorts, top homestays and even Airbnb. Treebo has some fantastic hotels in Coorg too. The tariff begins from Rs. 800 up to Rs. 3000 a night, depending on the type of room and season. Since you would be spending only half a day river rafting, it is best to use the remaining time of the day to go sightseeing. There are great places to see near Barapole. Located near the Barapole river, the Brahmagiri Wildlife Sanctuary is a must visit place for all nature enthusiasts. Besides spotting animals in their natural habitat, you can enjoy trekking and exploring the sanctuary by going on a nature trail. Guides to the forest cost Rs.200. 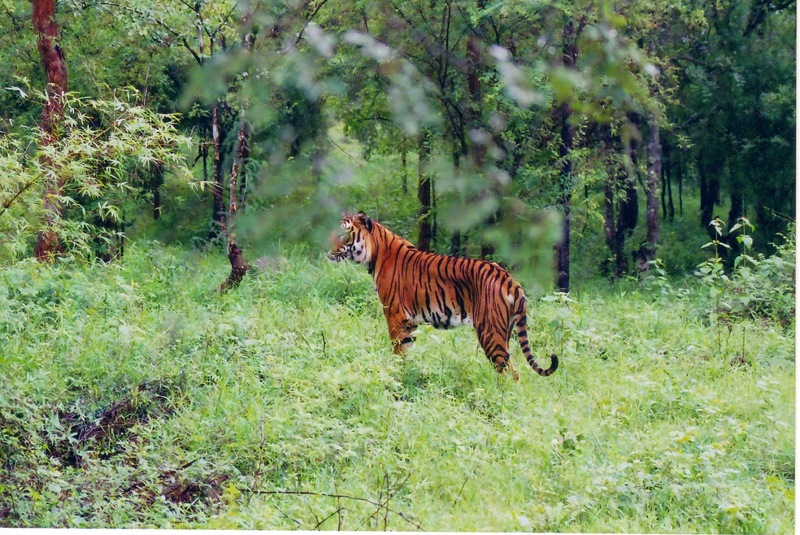 It is mandatory to book a guide while going trekking in the Brahmagiri Wildlife Sanctuary. Formerly a princely garden, Raja’s Seat has now been converted into a popular look out point. It offers stunning views of the hills and is a great spot for photography. Visit during the evening to catch a sneak peek of the sunset. This place was built for the royal dynasty. There are three tombs here, built in true Islamic architecture. The highlight of the tombs is the statues of Nandi bulls on top of the corners and the Shiva inscriptions at the entrance of the tombs. The Madikeri Fort is a historic fort. Now converted into a museum, the fort exhibits artefacts from the 17th century and there is a room with displays dedicated to General Cariappa. Outside the fort, there is a huge garden where you can enjoy long walks among the beautiful flowers. There are no restaurants near the Barapole river, the closest ones are in Madikeri. That being said, you can sometimes find locals selling fruits and snacks near the lake. If you looking for more filling meals, you can get them at hotels in Madikeri. Don’t carry your mobile with you while river rafting. Make sure you follow all rules and regulations properly. Always wear a life jacket while rafting. Make sure you keep a few hours as a buffer if you are travelling by public transport. Sometimes there could be delays. Do all your hotel and river rafting bookings in advance. So there you have it, all you need to know about river rafting in Coorg. From accommodation, activities, and the best time to go, you have all the information to plan your trip. Don’t wait anymore. Book those tickets and head to Coorg to enjoy some adventure in the sun. If you are keen on knowing about fantastic things to do in and around Coorg, ask us in the comments below and we will be glad to help you figure out a plan. In the meanwhile, read up on our other guides on Karnataka attractions, you’ll discover a lot of interesting places.